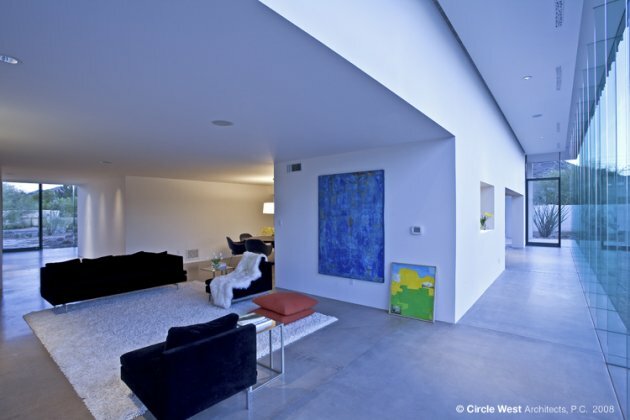 The Scottsdale, Arizona based Circle West Architects have sent us photos of their Desert House remodeling project, which is the private residence of Circle West’s founder Peter Koliopoulos. 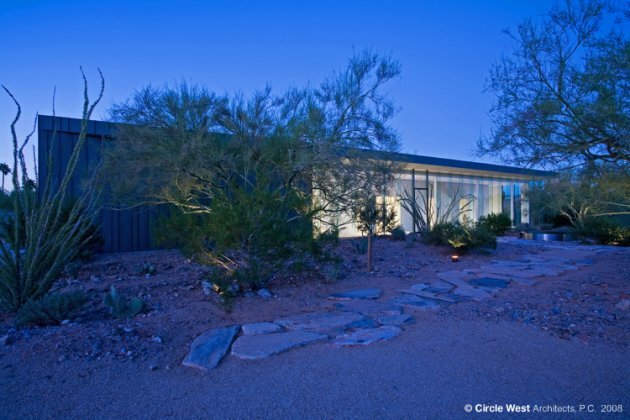 The single-family residence renovation represents a forward thinking approach to desert life. 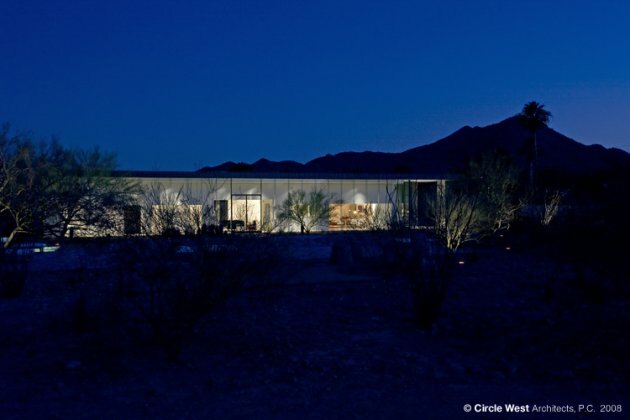 The one-acre site is within a single-family residential neighborhood, surrounded by textured desert mountains to the south, west, and northeast. The pure structure cuts a clean sharp edge through the revegetative desert landscape. The newly added program focus in the renewed design is to perforate the original frame of the existing home to allow a vibrant, natural daylighting experience. A large overhang on the South façade screens the plane of glass from the harsh summer sun, while allowing winter light to wash the interior walls. The east elevation is shaded by mature vegetation, while the west face of the residence has limited, strategically placed openings protected with large overhangs. 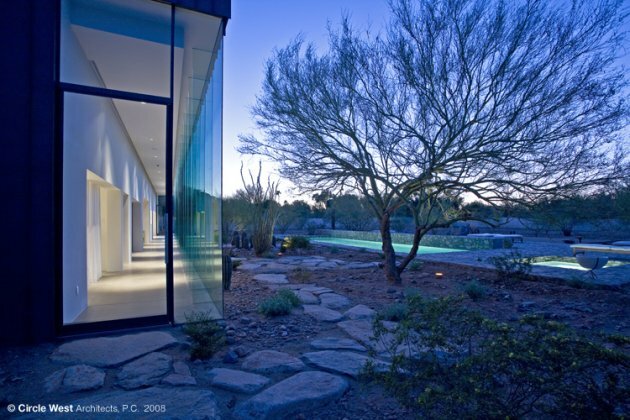 Views to the surrounding mountains and desert sky naturally radiate through the home. The additive program refines the circulation experience and relationships between uses for a spontaneous and organic residential experience. The concrete and stucco structure of the original house remains in tact minimizing material required to be sent to the landfill. A large percentage of the construction and building materials are high recycled content such as the glass, zinc siding, and concrete flooring. New high-efficiency HVAC units are utilized to condition the added space. All foreign landscaping and turf has been replaced with native plantings with very low water requirements. The one-acre parcel has been regraded to capture the entire roof and site rainwater, reducing the total amount of stormwater required to be treated by the municipality while naturally supplementing the vegetations needs. 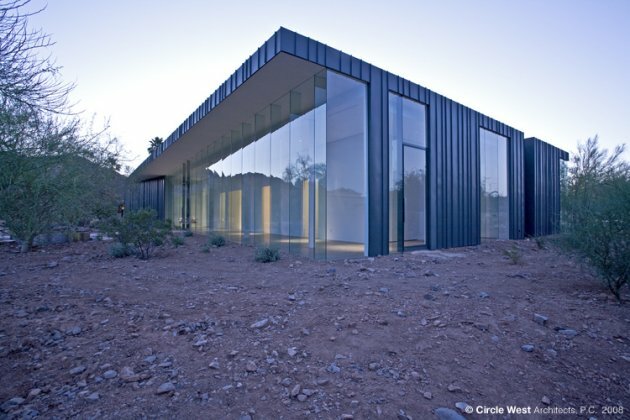 The layering of elements from the natural “filtering” of the desert landscape, to the exterior materials of zinc metal siding and glass sets a dramatic relationship of a refreshing living experience. 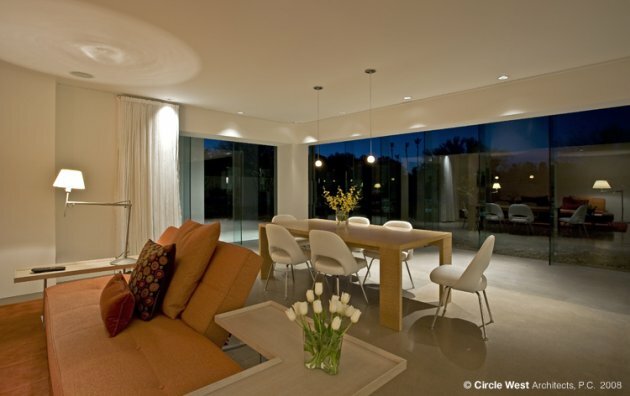 Visit the website of Circle West Architects – here.